Some things just need to be shared among friends and this is one of those things! Last night my fiance told me about something called "Rabbit Shaming", at first it sounded odd, but after he showed me what it was I was so glad he did. 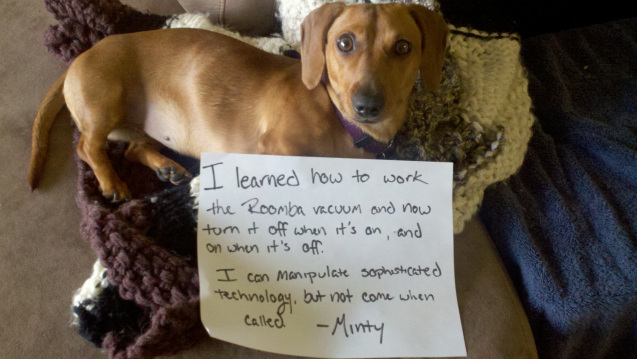 Being a doggy person I immediately had to search and see if I could find Dog Shaming - and of course there it was! Is there anything that doesn't exist online? We spend quite a lot of time last night looking through the funny pictures and thinking about all the funny things our own dog does, and considering taking a few similar shots! If you are a dog person I would definitely recommend checking out this website, it is so funny and some of the pictures and expressions on the dog's faces are just priceless.